Successfully Added Premium Digital Photo Frame + Multimedia Player - 12 Inch Screen to your Shopping Cart. 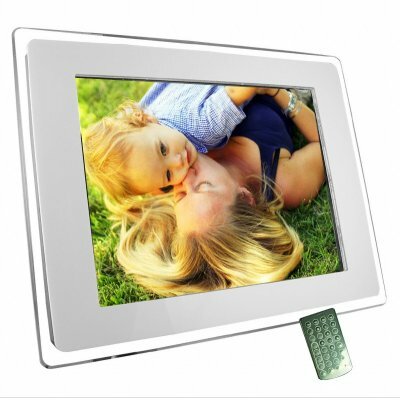 Premium digital photo frame and multi media player with large 12 inch TFT LCD screen. With this premium quality Digital Photo Frame (DPF) and MP4 player with its crisp 12" LCD display and two built-in 2W stereo speakers providing clear sound output, incredibly rich multimedia possibilities exist along with plug and play functionality. This versatile DPF would be ideal for the home near the computer or in a study, a dorm, the office or simply as a thoughtful gift. Full support for multiple digital formats gives you the flexibility to have a slideshow of your treasured photos with a range of transition effects, listen to your MP3 music or even watch MPEG1/MPEG2/MPEG4 films. This stylish and versatile DPF accepts a variety of digital media including SD, MS or MMC memory cards and also has a handy USB slot to easily transfer files across from your computer. The well-designed user interface and full remote control ensure easy and convenient access to this rich feature set. I ordered this frame for a gift on the wedding. The frame is good quality and everything was working, control is easy. THE GIFT WAS GREAT!!! ;) Recommend!